What train pass should I buy to visit Rhine Valley from Frankfurt? 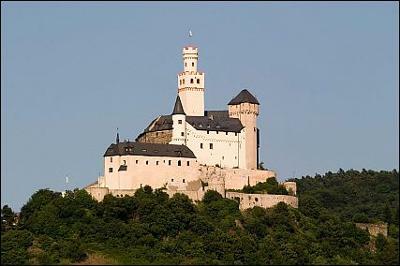 I will be in Frankfurt in July, and I want to make a one day trip to the castles on Rhine. My plan is to go all the way to Braubach by train, then to Rüdesheim by KD boat, and back to Frankfurt by train. I would like to know what is the best/cheapest choice for my trip. Could I use a Rhineland-Palatinate-Ticket? I am travelling with one friend. Thanks. You see, I am not an employee of Deutsche Bahn, otherwise I had suggested the Schönes-Wochenende-Ticket to you.:). You are right, when you travel on a weekend this is the best choice. The ticket costs € 39 when you buy it online, € 41 from a DB ticket centre at a train station, and € 42,90 when you purchase it on the train. Up to 5 people can travel with the ticket. The Schönes-Wochenende-Ticket is valid one day, either Saturday or Sunday. No, I don't think that it is valid on KD boats. Rita, thanks for your fast answer. It really clarified the doubts I had. Once I will have to buy two tickets, and we will be traveling on a Saturday, would it be better to buy a Schönes-Wochenende-Ticket? I´ve seen it on DB site, but I am not quite sure about the price. Is it just 39 EUR for the whole group (up to 5 people)? Last question: Can I use it on the KD boat, along the Rhine? I am afraid, the Rhineland-Palatinate-Ticket alone doesn't work because you travel in Hessen as well. You would need a Länderticket for both states. Prices and conditions for Ländertickets are different in each state. A Hessenticket is valid for up to 5 people and costs € 31 per day, whereas the Rhineland-Palatinate-Ticket costs € 24 for two adults. A single train ticket from Frankfurt to Braubach costs € 22.40 per person, and can be purchased online. For some reason, I didn't get a price for the return journey from Rüdesheim to Frankfurt when I checked the Deutsche Bahn website, but I guess it costs nearly the same. So if you buy a Länderticket for Hessen and one for Rhineland-Palatinate, this could be the best choice. Don't forget that these tickets are only valid from 9am during the week, but earlier on weekends. Also, you are not allowed to use ICE/IC trains. You can purchase the Rhineland-Palatinate-Ticket online, and the Hessenticket on ticket machines in Frankfurt. There is also a guided Rhine Valley tour available, but you are probably not so flexible on a tour. Return to Your German Rail Stories.